This GripMaster Elite series gets its name from the uniquely designed grip surface located on the beautiful Baltic birch wood top. The grip design on the elite series is well thought out, leaving multiple accessory mounting locations (cell phone, smartphone, tablet, mobile printer, and more). Adding the tablet mount to any AutoExec desk is a perfect way to free your mind from worrying about your tablet moving around the vehicle when in motion. The mount is universal and supports many different models, including iPad and Android tablets. The spring loaded cradle makes loading and unloading your tablet easy while keeping it safe and secure. The high strength composite material is perfectly molded to maximize the functionality of your device by not obstructing the tablet ports. This specific model features a pull-out work surface that is great for writing or housing a laptop while briefly typing. You will also be able to enjoy extra hidden storage and hanging file space. These features combined make the GripMaster Elite series the all-around mobile workspace and organizational tool for your vehicle. Along with its attractive wood top comes extra strength and longevity. When paired with the rugged polypropylene plastic base, this desk becomes nearly indestructible. The desk seat belts easily into the front passenger seat and can be installed or removed in seconds. 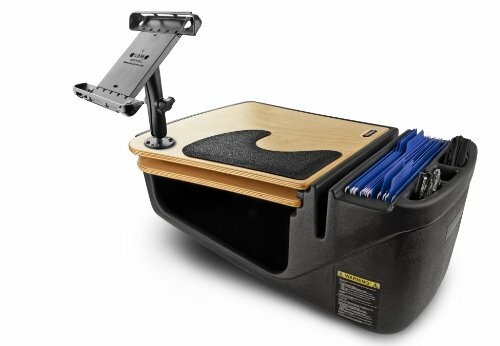 The top surface of this desk is covered with the rubber non-skid material to help ensure your laptop, briefcase, or cell phone won't slide while the vehicle is in motion and the additional pull-out surface provides extra work space.